The 2015–16 AHL season is the 80th season of the American Hockey League. The regular season began on October 9, 2015, and ended on April 17, 2016. The 2016 Calder Cup playoffs follow the conclusion of the regular season. An attendance record was set with a league average of 5,982 spectators per game, surpassing the record set in 2004–05. On May 12, 2015, the AHL unveiled a new, major realignment of its conferences and divisions for the 2015–16 season, a move made as a result of the relocations of seven franchises, including five teams moving to California, one to Manitoba, and one to Newfoundland and Labrador. Mirroring a change the National Hockey League had taken prior to its 2013–14 season, the AHL moved back to having four divisions of seven or eight teams. The Eastern Conference consists of the Atlantic and North Divisions, while the Western Conference consists of the Central and Pacific Divisions. On June 13, the league commissioner, David Andrews, disclosed that the five California teams would each play 68-game schedule; the other 25 teams (including the two Texas-based teams that share the Pacific division with the California teams) would play 76 games apiece. The implementation of an unbalanced format was seen as a way to ease the California teams' travel costs as well as reducing stretches of 3 games in 3 nights, which can impede player development and hamper attractive forms of play. To alleviate the 68/76-game imbalance, the AHL began using an alternative method of ranking its teams and determining playoff seeds. As before, standings points are still awarded (two points for a win, one point for an overtime or shootout loss, none for a regulation loss) but rather than ranking teams by the total number of points earned, they are positioned by their points percentage, determined as the number of points earned divided by points available to them. For example, a team earning one win and one overtime loss after two games would have a .750 points percentage (3 points earned divided by 4 points available). In support of the new division, the AHL played an outdoor game called the Golden State Hockey Rush at Raley Field in West Sacramento, California on December 18, 2015. The Stockton Heat defeated the Bakersfield Condors 3–2 in front of 9,357 fans. Under a plan approved by the league on January 29, 2015, the league established a Pacific Division, with five teams based in the state of California. All five teams are affiliated with NHL franchises based in western North America. In the season prior to the realignment, the league had no teams west of Texas (and only one western team, the Abbotsford Heat, had played in the AHL in the five seasons prior to that), causing call-up issues for western NHL teams. 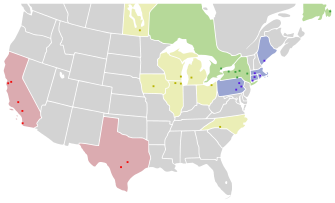 In return, the three ECHL franchises already based in the cities where the AHL franchises were relocated east and took the place of AHL teams that had left those cities. On March 12, 2015, the AHL announced that the True North Sports & Entertainment-owned franchise, the St. John's IceCaps, was relocating back to Winnipeg, Manitoba to make it easier for their NHL team, the Winnipeg Jets, to call-up players. In order to fulfill their arena contact in St. John's, they negotiated with the Montreal Canadiens to move the Hamilton Bulldogs to St. John's and take on the IceCaps identity; in turn, the Bulldogs fulfilled their arena obligation by transferring their lease and intellectual property rights to the former Belleville Bulls, a junior hockey team. The Adirondack Flames relocated to Stockton, California to become the Stockton Heat as part of a new Pacific Division. The Calgary Flames purchased the ECHL's Stockton Thunder and relocated the team to replace the Adirondack Flames in Glens Falls as the Adirondack Thunder. The Hamilton Bulldogs relocated to St. John's, Newfoundland and Labrador and took on the identity of the St. John's IceCaps. The Montreal Canadiens purchased the Bulldogs franchise from Michael Andlauer prior to the announcement of the relocation. Andlauer purchased an Ontario Hockey League franchise to replace the AHL team and gave it the same name. The Manchester Monarchs relocated to Ontario, California to become the Ontario Reign as part of a new Pacific Division. The franchise is swapping places with the Ontario Reign of the ECHL as both franchises are owned and operated by the Los Angeles Kings. The Norfolk Admirals relocated to San Diego, California to become the San Diego Gulls as part of a new Pacific Division. The Admirals franchise was purchased by the Anaheim Ducks and is their owned and operated AHL team. On December 18, 2014, the Oklahoma City Barons announced it would cease operations at the end of the 2014–15 season after the Barons' management failed to come to an extended affiliation agreement with their NHL affiliate and franchise owner, the Edmonton Oilers. On January 29, 2015, it was announced the franchise will establish a new team in Bakersfield, California to become the Bakersfield Condors as part of the new Pacific Division. Unlike the Barons, the Condors are owned and operated by the Oilers organization. The Condors replaced the Oilers' ECHL team of the same name who relocated to Norfolk and took on the Norfolk Admirals identity in the ECHL. The franchise owned by the Winnipeg Jets that has played as the St. John's IceCaps since the 2011–12 season, relocated back to Winnipeg, Manitoba to play in the same arena as its parent club and returned to its previous identity as the Manitoba Moose. The Worcester Sharks relocated to San Jose, California to become the San Jose Barracuda as part of the new Pacific Division and share the SAP Center with its parent club, the San Jose Sharks. During the regular season, the sudden-death overtime period is reduced to five minutes (5:00) in length but full playing strength is 3-on-3 (plus goaltenders) for the entire period. Overtime will be preceded by a "dry scrape" of the entire ice surface. Teams will change ends at the start of overtime. If the game is still tied following overtime, a winner will be determined by a three-player shootout. This change mimics the change made in the National Hockey League for the 2015–16 season. In the previous season, the AHL first experimented with 3-on-3 overtime but had three minutes of 4-on-4 play before reducing the number of players on the ice. This change caused 75 percent of games tied at the end of regulation to end in overtime in the 2014–15 season. This was reduced from just 35 percent in the 2013–14 season, decreasing the number of games decided by shootout. A team may use a "coach's challenge" to initiate an official video review; only those situations which are subject to review by rule may be challenged. A team may only request a coach's challenge if it has its timeout available, and the coach's challenge must be effectively initiated prior to the resumption of play. If the coach's challenge does not result in the original call on the ice being overturned, the team exercising such challenge will be charged with a timeout. This change is identical to the rule change implemented by the NHL for its 2015–16 season. For face-offs conducted on any of the 8 face-off dots outside center ice, the defending team's player (i.e. the player closer to his team's goal) shall place his stick on the ice first, followed immediately by the attacking team's player. For face-offs at the center ice dot, the order of stick placement shall proceed as before, with the player from the visiting team placing his stick on the ice first, followed immediately by the home team's player. This rule change mirrors one the NHL also implemented for 2015–16; previously in both leagues, the visiting team's player placed his stick on the ice first regardless of the face-off location. The 2016 playoff format changed as a result of the realignment and unbalanced regular season schedules. The new playoff format was finalized at the Annual Board of Governors meeting that took place July 6–9, 2015. During the regular season, teams receive two points for a win and one point for an overtime or shootout loss. The top four teams in each division ranked by points percentage (points earned divided by points available) qualify for the 2016 Calder Cup Playoffs, with one exception in each conference: if the fifth-place team in the Atlantic or Central Division finishes with a better points percentage than the fourth-place team in the North or Pacific Division, it would cross over and compete in the other division's bracket. The 2016 Calder Cup Playoffs will feature a divisional playoff format, leading to conference finals and ultimately the Calder Cup Finals. The division semifinals are best-of-five series; all subsequent rounds are best-of-seven. The following players are sorted by points, then goals. Updated as of April 17, 2016. The following goaltenders with a minimum 1500 minutes played lead the league in goals against average. Updated as of April 16, 2016. ^ "AHL teams establish all-time attendance record". AHL. April 18, 2016. ^ a b "AHL announces alignment for 2015-16". AHL. May 12, 2015. ^ "California AHL teams to play 68 games; more from President/CEO". LA Kings Insider. June 13, 2015. ^ a b c d e "Board of Governors approves changes for 15-16". AHL. July 10, 2015. ^ "Grant, Kylington and Shore Lead Heat to 3-2 Win at Raley Field". Stockton Heat. December 19, 2015. Retrieved January 20, 2016. ^ "AHL approves formation of Pacific Division". AHL. January 29, 2015. ^ a b "AHL announces franchise transactions". AHL. March 12, 2015. ^ "Adirondack Flames to announce move to the ECHL". Glens Falls Post-Star. January 29, 2015. ^ "The Montreal Canadiens announce the transfer of the Hamilton Bulldogs to St.John's, Newfoundland". Montreal Canadiens. March 12, 2015. ^ "AHL announces relocation, Norfolk Admirals move". WAVY-TV. January 29, 2015. ^ "AHL's Oklahoma City Barons to cease operations at end of season". NBC Sports. December 18, 2014. Retrieved January 29, 2015. ^ "Moose 2.0? True North will move AHL franchise back to Winnipeg". Winnipeg Free Press. March 12, 2015. ^ "Sharks, Barracuda Networks Agree to Revolutionary Multi-Year Presenting Partnership". San Jose Barracuda. April 2, 2015. ^ a b c "Falcons, Monsters, Rampage swap NHL affiliates". AHL. April 17, 2015. Archived from the original on 2015-04-17. Retrieved 2015-04-17. ^ "Pirates announce affiliation with Florida". AHL. March 18, 2015. ^ "AHL rule changes: NHL OT format, points percentage for playoffs, coach's challenge". Yahoo Sports. July 10, 2015. ^ "Top Scorers - 2015-16 Regular Season - All Players". AHL. ^ "Top Goalies - 2015-16 Regular Season - Goals Against Average". AHL. ^ "Wilkes-Barre/Scranton's Tom Kostopoulos Voted Winner of AHL's Fred T. Hunt Memorial Award". OurSports Central. April 8, 2016. ^ "FRANK S. MATHERS TROPHY". AHL. Archived from the original on 2016-05-09. Retrieved April 21, 2016. ^ "NORMAN R. (BUD) POILE TROPHY". AHL. Archived from the original on 2016-04-14. Retrieved April 21, 2016. ^ "EMILE FRANCIS TROPHY". AHL. Archived from the original on 2016-04-14. Retrieved April 21, 2016. ^ "F.G. (TEDDY) OKE TROPHY". AHL. Archived from the original on 2016-04-14. Retrieved April 21, 2016. ^ "SAM POLLOCK TROPHY". AHL. Retrieved April 21, 2016. ^ "JOHN D. CHICK TROPHY". AHL. Archived from the original on 2016-04-14. Retrieved April 21, 2016. ^ a b "2015-16 American Hockey League First and Second All-Star Teams Named". OurSports Central. April 7, 2016. ^ "2015-16 American Hockey League All-Rookie Team Named". OurSports Central. April 6, 2016. This page was last edited on 15 April 2019, at 15:38 (UTC).